Won’t you take a moment to listen? I know you’re comfortable now and perfectly fine with the way things are….but can we open the Scriptures together? Go back with me to 1 Kings 18. The people of Israel have been led away from God. King Ahab and his wife Jezebel led the people into the worship of the false god Baal and a mixture of other idols. The worship of Baal, most likely a Canaanite sun-diety, involved some very terrible things (child sacrifice, mutilation, prostitution/sexual immorality, etc). People had moved away from worshipping God alone. Now pluralism and immorality were the hot trends. In other words, it was just like things are today. “All religions are equally valid. Who’s to say who’s right?” Sounds familiar, right? Those statements are totally illogical and foolish but many who consider themselves educated and ‘modern’ just echo what’s been around forever. Isn’t this the same thing you do? Aren’t you just like the Israelites? Mixing in just “a little God” in your life while also having other idols you actually worship? Yeah, you “give God” your Sunday, but the rest of the week is yours, right? Pick and choose. Undercover pluralism. Sure, you used to be passionately trying to live every day for Him, but that faded out over time. You’ve settled into this comfortable place. No challenge or lines in the sand. But there’s a question that can pierce it all. Succinct and precise. Timely and timeless. Bold and simple. A two-sentence manifesto for life. QUIT trying to play the middle ground. It’s just an illusion. Being lukewarm is just a slower way of regressing away from God. How long will you try to love God a little but still be “cool” with the ways of the world? How long will this foolishness go on? Quit trying to go north and south at the same time. There’s only one right answer. Truth has to be exclusive. All beliefs aren’t equally valid. A man can’t serve two masters. Which will it be? Those two sentences come to haunt you now, but it’s for the best. They come to pierce your illusion of comfort and to push you to a decision. What will your life truly be about? What will your anthem be? Maybe it’s time for a test…. 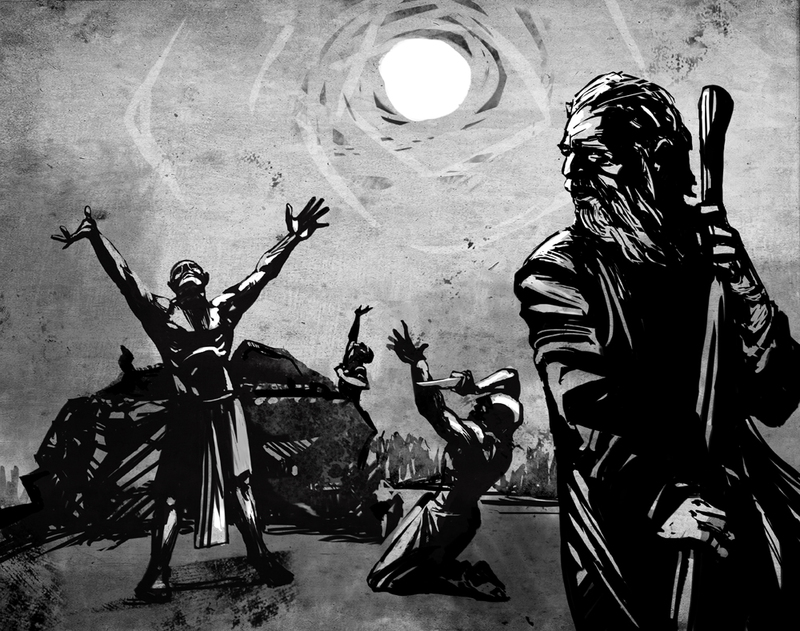 Elijah issues the challenge: 450 prophets of Baal versus him alone. Each side will build an altar and present a sacrifice on the altar. The prophets will call out to Baal, Elijah will call out to God. Whichever deity answers with fire is the true God. Game on. The prophets of Baal start at morning and go till noon, crying out the entire time. Nothing is happening. Elijah breaks in with…….Godly sarcasm? Ouch! Elijah speaking these words at noon would’ve been especially indicting. Baal, a sun-diety, would’ve been MOST likely to really show up at high-noon, right? Instead, Elijah is clowning these dudes. Things escalate quickly. The prophets cry out louder and louder. Soon, blood is flowing as they grab swords and start to cut themselves to appease Baal. The contrast is downright stunning. All these men crying out as loud as they can for hours on end, their words echoing off the mountainous rocks. But the air was wholly silent. Silence can be deafening…this silence would’ve been defeating. No words, no whispers, not a single decibel. And not a flame or flicker in sight. Idols NEVER answer back when you want them too. Idols lead you to give everything and absorb the cost, but they never answer. They just take you further from the True God. The One who’s about to set this place on fire. The sound and fury of the prophets signified (and resulted) in nothing. Now it’s Elijah’s turn. He calls the people to come near to him. With his own hands Elijah took twelve stones and built his altar. The people of Israel would have recognized this silent, symbolic protest against the broken kingdoms they had become. The twelve stones were to symbolize the unity that used to exist among the people. Elijah then builds a trench around the entire altar and makes a curious request. He wants a total of twelve (again “twelve”) huge jugs of water poured on the sacrifice. When you are hoping for a fire to start, a general rule of thumb is “the less water the better.” Ol’ Eli instead drenches the entire stone altar, wood, and sacrifice in water. The trench fills up. Water everywhere. Then, just as he did with the two-sentence masterpiece earlier, Elijah gives a beautifully, efficient (if I may use that word) prayer. The prophets just spent hours screaming and making themselves bleed…countless words and chaos to get nothing. Elijah uses roughly 63 words (less in Hebrew). Less than 20 seconds to speak it. Elijah is done in a matter of moments. Simple, God-glorifying, revival-seeking prayer. And God shows up. FIRE. See how it starts at the top of the altar and works it’s way downward? This matters because false prophets of this time were known to try and light fires from underneath an altar to give the illusion of a miracle. Not here. God leaves no doubt. Sacrifice first, then wood and stones, then dust, then water. Top to bottom incineration. God answers. God is involved. God exists. And, did you notice how God’s devouring fire hit the sacrifice and not the sinners? Weren’t THEY the ones who had gone way off-course? Didn’t THEY deserve to face judgment? Why did the fire hit the substitute instead? Because this isn’t just a nice story about Elijah. It’s the Gospel. In your lukewarm living, you have left the deep joy available in God so you can pursue comfortable living and idol-worship of things that pass away. That’s gross sin. You deserve the judgment too, don’t you? But God’s wrath hit our True Sacrifice instead of us sinners, remember? Jesus was the One who faced the heat of God’s wrath in our place. You should’ve been the one to face that, but Jesus willingly became your Substitute on the Cross. This all began with a simple test to see whether Baal or God was real. Which is the real, true, living God? Who’s real and who is fake? Who can actually produce an ANSWER? To defeat your lukewarm heart, remember the test much bigger than the one Elijah put forth. How about a test of every religion or philosophy that’s ever existed? Death is the one common enemy every single human being in the history of the earth has had to face. Rich or poor, great or lowly, across every nation and culture, every one who draws breath will someday cease to do so. Now, let’s put every religion and their founder, every philosophy and it’s thinker, every deity ever thought to exist to a test. Can ANY of them conquer death? Don’t worry about screaming aloud for hours on end. And please…put the sword down, as there will be no slashing your body today. Let me save you the trouble. ONLY JESUS has conquered death. His resurrection is a historical fact. He is the True Sacrifice but also the One who rose again in victory over the grave. And it gets better: His death and resurrection was the fulfillment of MANY detailed prophecies over thousands of years ahead of time. And don’t stop there either; Jesus Himself relentlessly and repeatedly claimed He would die and then resurrect three days later. He CALLED His shot in His victory over death. In the ultimate test of every person’s common enemy, Jesus alone has triumphed. The other religions, thinkers, and leaders have some nice ideas and some valuable ethical teachings…but they are silent from the grave. Jesus alone has ANSWERED man’s deepest cry. The Lord is GOD! They humbled themselves and confessed. It’s no surprise that true repentance like this usually begins in the dust. Face down. That’s where lukewarm gets left behind and passion is renewed. Now, you have the opportunity to confess and repent too. To taste the bitterness of dust in repentance is to also taste the wonderful mercy of having the chance to change. It is “because of His mercies we are not consumed,” (Lamentations 3:22). The Lord, He is God. The Lord, He is GOOD. Lukewarm is not for you. It cannot be the anthem of your life. You were set free by Jesus so you can live to make Him famous. Come back to the Cross and see Jesus dying in your place. See that He is God. Come back to the empty tomb and let the Living God turn your heart back again. Be renewed by the wonder of His amazing, unfailing, unstoppable love. Let the lukewarm be consumed and burned off. Let the half-hearted worship go down in a blaze of His glory. It’s time to post Baal. Let ‘em burn. I wrote this letter to a very specific lukewarm Christian—that is, I wrote this to myself. Too often, I am like the Israelites, who try to have God along with other stuff. My desire is to be like Elijah. He was hated by the powers-that-be, and was viewed as an outcast by the culture, but he refused to compromise and was unafraid to let God display His glory in awesome ways. I don’t want mediocre love for God, I want that Elijah-type of zeal. So, I find I must preach against the tendency towards lukewarm living in myself and that is where this comes from. If it is you as well, I pray we do not settle for comfortable, casual Christianity. Is that even possible? It’s time to remember the bright and blazing truth of the Gospel, and in so doing, find He has stirred up the flames of passion in our hearts for His glory alone. I’ll close with a simple recommendation. Jon Foreman has taken the beautiful prayer of Elijah and made it into a quiet song of personal revival. Take a moment to make this your own prayer. This entry was posted on February 3, 2014 by Josh Humbert in Blogroll and tagged 1 Kings 18, Christianity, elijah, idols, Jesus, Jon Foreman, lukewarm, passion, pluralism, resurrection, top 5.